6. Some rival operators have raised general concerns about the equivalence of PIA/DPA. The argument follows that Openreach may apply different expectations or obstacles to rivals than they themselves follow. The wayleave issue mentioned above is arguably one such difference, albeit tricky to solve without Ofcom/Government intervention. Other equivalence issues may potentially be perceived to stem from Openreach’s use of its own network in terms of the apparatus it deploys, as well as its own engineering principles / solutions. Some operators are further concerned that Openreach may be encouraged to deploy inefficient space-consuming equipment, such as on top of poles, which may hinder the potential for use by a rival. What are your thoughts on these concerns and are they issues that could ever be reasonably addressed by future changes (if so, how)? We’re a highly regulated business and we’re committed to meeting all of the legal obligations that Ofcom sets out for us. But it goes beyond that. We’re also committed to making duct and pole access fit for purpose, and we’re continuing to work on a significant set of enhancements over the coming year which will add further automation and flexibility to the product for scale operators. I have to say it would make no commercial sense for us to deploy inefficient processes or equipment, when the reality is that this stuff is already sufficiently complex and costly to build in the first place. What we really need is for operators to collaborate and work in partnership with us on enhancements, and we need to be working together as an industry, with the Government and Ofcom, to create a more effective regime overall. There are lots of issues we agree on – for example the need for network builders to be given the same kind of access as utilities get when it comes to repairs – and we can achieve some really positive changes if we work together. 7. Openreach has introduced some limited Service Level Agreements (SLAs) and Guarantees (SLGs) to PIA, although among the larger alternative network providers there’s a feeling that these still need to be improved, such as to make the product more predictable and give them the confidence to adopt it at scale. Do you think further changes can be made to cater for this and if so, what is planned? We’ve introduced a full suite of SLAs and SLGs and we’ll be regularly reporting on our performance. We’ve also agreed to a 12 month ‘bedding in’ period during which no SLGs will be in force and we will engage in an industry review led by the OTA. We’ve also shared top level plans with Industry on the items we’ll be working through over the next 12 months. 8. Do Openreach foresee any other problem areas cropping up with the most recent revision of PIA? There’s always going to be some bumps in the road with any new process or way of doing things. But if there are issues, then I believe we’ve put the resources in place to avoid them impacting customers. We do have some concerns over a lack of forecasting. If we were to face a sudden influx of un-forecasted demand then it could give us some challenges with things like field validation of Network Adjustments. However we’ve done our own planning on what that demand’s likely to be, and we’ve worked with our operational teams to prepare for moving resources around should we need to react to sudden spikes. 9. 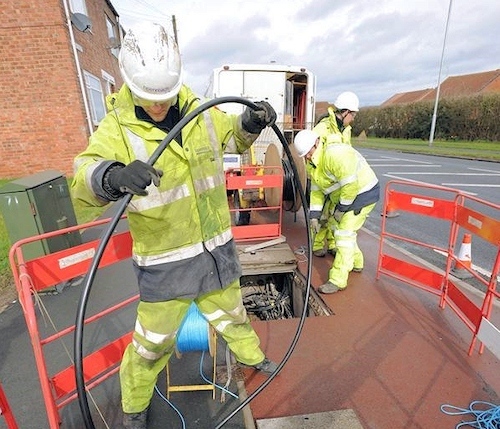 The revised PIA product adopts a “mixed usage” approach, which Ofcom believes will enable greater flexibility in the use of Openreach’s cable ducts and poles by rivals (i.e. creating stronger business cases for more investment). As a result ISPs should be able deploy local access networks offering both broadband and non-broadband services, albeit provided the primary purpose of the network is the delivery of broadband. However Ofcom’s latest business connectivity review has proposed to change this again by adopting “unrestricted usage” of ducts and poles. Currently PIA primarily only focuses upon the residential and small business market, while unrestricted usage suggests that companies offering high-speed lines for large businesses/mobile/broadband operators may also be able to make use of it. On the one hand this could further help rivals to build competing networks with more attractive business models by using your existing infrastructure. On the other hand it also appears to be directly competitive with some of Openreach’s own products. What are your concerns around unrestricted usage and do you intend to oppose it? We understand the importance of access to our ducts and poles as a means of encouraging other operators to build competitive fibre networks throughout the UK. We don’t believe Ofcom has properly made the case for extending DPA beyond ‘mixed usage’ however, we’re not opposed to the further extension of the scope of DPA provided we receive greater certainty in some key areas of the forthcoming regulation. 10. Finally, do the changes to PIA/DPA broadly help or hinder Openreach’s own “Fibre First” strategy, which is currently working to make FTTP broadband available to 3 million premises by the end of 2020 (March 2021 financial) and possibly 10 million by around 2025? To be honest it’s not really a question of helping or hindering us. We’ve been really clear that if the UK is going to achieve the Government’s 2033 ambition, we need to be a dependable partner for alternative networks – which means having an effective PIA product. At the same time, we need to be out there building our own network at scale and pace. It’s both in parallel and we’re very clear on that. Obviously, we are building faster, further and – we believe – to a higher quality than anyone else, and we’ve passed more than 1.2 million homes and businesses so far. But we’re also helping others to build by taking advantage of our ducts and poles. That is really important to us. We’re only going to meet the Government’s ambition by working together. 11. Anything else you want to add before we finish, Katie? We’ve spent a year in the nitty gritty of product, process and systems development, as well as the contract negotiations which can be contentious – but we all now need to get on with it and get some real experience of customers using the product before anyone comments further on its effectiveness. We’re determined to deliver a highly useable, highly scalable product and to meet all of our regulatory obligations so it’s now about getting on and using it, then improving it from there. I’m looking forward to seeing an increase in activity over the next few months, as more network providers start to build at scale, and I actually want to thank our customers for all their feedback in the discussions so far. We’ll be continuing to work with them, Ofcom and the OTA as we develop and refine the product over the coming months. ISPreview would just like to thank Katie Milligan for kindly taking the time to respond to our questions. Scottish Law is not really my thing. Is there something specific thats an issue here? The best/only way to deal with the wayleave issue is legislative. Clearly 2 different routes need 2 fees but 2 cables in the same duct shouldn’t. As much as I’d lie the altnetc to take a greater market share I do think there is some cheek on their parts. They seem to want to ride on the back on ORs network without paying for the costs (and RoR). That depends on how the wayleave is drafted. If on the other hand it say “conveying all of the wires, connections necessary for communications and permitted by XYZ Ltd” then XYZ can allow or disallow what they want. The joker is the awkward wayleaves that specify along the lines of “conveying telephony wires and associated installed by XYZ” these are a bit of an issues as wires are not fibres and so these need to be renegotiated. Then of course we get onto the good old deemed wayleaves………it is sunny outside and this is getting boring. Perhaps the solution is for the telcos to pay for use of the ducts and poles which could be publically owned, perhaps under the local highway auuthority? All I can see in that change is a bureaucratic nightmare. To have a network builder/owner/user all separated would be a headache and a half. They usually started that way. I worked on bts ug network for 20yrs and I can tell you the network is in a terrible state.Years of under investment has led to the point where the ducts are seriously congested, blockages common and where cable recovery took place many of the clay ducts collapsed.Where ducts cross bridges in steel duct and Hessian cable was present the whole length is condemned,the only answer is mass investment and that is very unlikely.you’ve got to see it to believe it!!! That’s what’s been going on in Fibre First areas. Duct unblocking where possible, overlay where it isn’t. Cables aren’t a concern once Openreach can retire copper. Zero value in spending too much on copper right now. Duct congestion will be alleviated by this too, as long as a fibre subduct can be pulled. A cynic might suggest BT did the bare minimum due to impending separation from OR. The “do nothing” strategy dated more from the Valence era where smart arsed penny pinching accounting rules KO. In those days remuneration cycles were short so anything to increase bottom line looked cool. Trouble is “do nothing” maintenance leaves a big old problem…. I’m not aware of any telco, cableco or comms company that maintains their ducts just because. Been keeping an eye on the roadworks website for the Vodafone roll out in my area, and there’s quite a few duct clear jobs cropping up. Must make the overall planning a nightmare. It also very important when discussing PIA to mention the importance of PIA training and Accreditations that are vital to ensure safety in the networks and ensuring no damage is caused to existing infrastructure and equipment. CTTS Training are an approved PIA Accreditaion centre for PIA and are helping CP’s meet the engineering standards expected when installing cables sub ducts in the OH and UG environments. I’d be interested in who would repair damage to cable using oenreach duct and cable in the case of mechanical damage or vandalism. Is this written into the SLA. Also has someone in Open reach wavec a magic wand over the duct/cable records and everything is up to date now. We had some faults in a few streets near me,I was surprised to see no ducts, just wire buried a few inches below the tarmac, so a complete open cut hundreds of metres to lay fibre then, believe it when I see it.